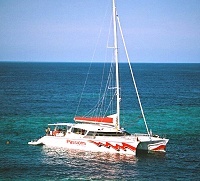 Passions of Paradise is a 25metre sailing catamaran that offers a unique outer reef experience! This trip attracts a water active clientele looking for a modern, fast and fun sailing experience. Passions of Paradise is a new vessel bristling with the latest cutting edge technology in sails, deck hardware and electronics. The vessel goes to a gorgeous little patch reef known as �Breaking Patches' on Paradise Reef. Passions of Paradise is lucky enough to have an exclusive mooring on this reef, ensuring passengers a truly unique experience. This site is perfect for both certified and introductory divers. On the sail home you will stop at Michaelmas Reef, a beautiful sand cay surrounded by reef and warm shallow water, perfect for snorkelling, swimming or just lazing on the beach! Return catamaran sailing to two outer reef sites.